« Brandis’s Gotcha! IPA’s Tim Wilson the new voice of freedom? Our joint article is in Holocaust Studies Autumn 2013. Polish reactions to the German TV series Generation War, which has just screened in Australia, confirm that the history of World War Two remains highly contentious. The resulting public debate tested Polish-German and Polish-Jewish relations and placed historical memory at the forefront of the disputes. The series first aired in Germany last March. It told the story of five young Germans in the 1940s who, as German newspaper Der Spiegel put it, “lose their innocence without being malicious”. The broadcasts contributed to Germany’s ongoing re-assessment of its past, especially among post-war generations. The series inevitably raised questions about the responsibility of ordinary Germans for the crimes of the Nazi regime. More specifically, questions were asked about these depictions on public television in a historic drama miniseries, which was sure to attract a wide audience. The reactions in Poland focused less on Germans being presented as likeable human beings caught in the war than on Poles being portrayed as anti-Semites. Such depictions (in only a few secondary scenes) led the director of Polish public television, Juliusz Braun, to fire off a protest to the German TV station. His letter objected to the injurious and false simplifications of the historical image of Poland, which could not be justified by the creators’ artistic freedom. Protests by Polish public organisations led a month later to the government issuing an official letter of protest signed by the Polish ambassador to Germany. The Polish embassy in Washington protested at plans to broadcast the series in the US. The news in August that the BBC would air the series caused another uproar in Poland. The sizeable Polish community in the UK held protests against screening “a film slandering the Polish Home Army”. 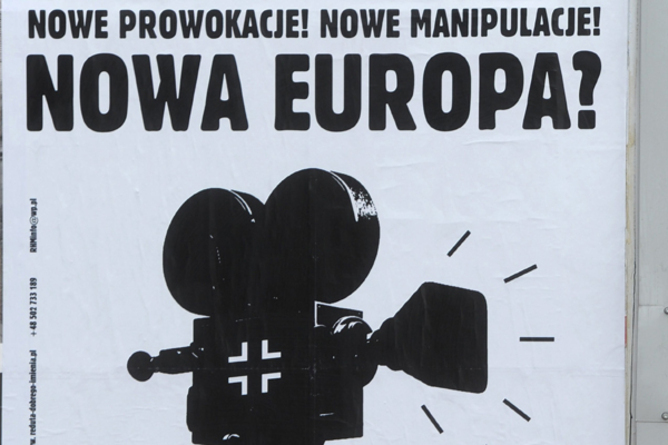 In Poland, the broadcasts on three consecutive evenings last June was preceded by an aggressive drumming up of expectations of controversy about a German director’s negative depiction of Poles. It was difficult to watch the series without anticipating those most “controversial” bits. These became the focus of a debate aired live after the last episode. In an ironic turn of events, Juliusz Braun was heavily criticised for screening the series on public television in Poland. The leading Polish right-wing party, Law and Justice, demanded his immediate resignation. The Polish Anti-Defamation League contacted the Attorney-General’s Warsaw office to report a crime of “public slandering of the Polish nation”. Why has this series caused such a strong reaction in Poland and among Polish diaspora around the world? In the post-war Soviet takeover of Poland, the Polish Home Army was dismantled. Its members were vilified, persecuted and executed (or otherwise exiled for life). For many generations of Poles, the Home Army soldiers came to symbolise honour and ultimate sacrifice in the fight for freedom. Accepting that the Home Army was anti-Semitic would go against the myth of the glorious Polish soldier and survivor. The notion of martyrdom that this evokes, centuries-old and all-important in the Polish imaginary, is always accompanied by tales of heroism. In this TV series, instead of heroes, we see a bunch of dirty and primitive bandits who commit very questionable acts and display questionable attitudes. Since 1989 Poland has sought to recover the “historical truth” after half a century of Soviet propaganda. Contemporary Poles, who in their vast majority rejected the Soviet version of history, have been engaged heavily in making public the “real historical truth” – the version of history silenced by the pro-Soviet regime. Truth about the Katyn massacre is a perfect example. However, within this project of rewriting the national history, it is difficult to fit in multiple interpretations and varying viewpoints, especially on the most sensitive topics. Generation War’s five main characters are portrayed as young, idealistic and somewhat naïve. The experiences of the war lead them to certain actions that might be questionable, but, as in any film or TV series, the viewer cares about and feels for them. The implicit message is that these were the average Germans. Caught in the enthusiasm for the war project without being ideologically involved with Nazism, when faced with harsh reality they were forced to act as they did by circumstances and not by their own will. The character of the SS officer does not in itself balance the overall impression that the main German characters are almost the victims of the war and not the perpetrators. Among non-German characters, on the other hand, the Polish Home Army soldiers are probably the least sympathetic of all. In the scenes that most outraged the Polish public, they are simply repugnant and framed almost as perpetrators of the Holocaust. This is an issue so sensitive in Poland that after US president Barack Obama referred to “Polish death camps” in 2012, heformally apologised for the “inadvertent verbal gaffe”. Obama acknowledged that these were, in fact, Nazi camps located on German-occupied Polish territory. So, were/are Poles anti-Semitic or not? Well, yes and no. The fury over the TV series confirms that this issue remains highly problematic. It is difficult to accept expressions such as “Polish death camps”, with its implicit message that these were Polish-orchestrated and operated. It is equally difficult to accept that there were no anti-Semites in the Polish Home Army, or anti-Jewish crimes committed by Poles. Poles were victims of the Nazi terror, but some Poles also perpetrated anti-Jewish violence. Neither one nor the other can be denied. A fully accurate re-examination of this chapter of history will be impossible. This is because of the unreliability of primary sources from the WWII-era, due to the age of first-hand witnesses, as well as Soviet authorities’ heavy postwar manipulation of the collecting and archiving of testimonies. Thus the goal for the historians will be to engage younger generations in a constructive dialogue by carefully considering multiple viewpoints and experiences. The national project of rewriting Polish history ought to have room for a re-evaluation of Polish attitudes towards the Jews. Poland should seek a reconciliation with this difficult chapter of the past and ultimately a celebration of a 1000-year Polish Jewish history so that, as Michael Gawenda wrote, the story doesn’t have to end in a cemetery. This entry was posted on January 31, 2014 at 3:53 pm and is filed under Uncategorized. You can follow any responses to this entry through the RSS 2.0 feed. You can leave a response, or trackback from your own site.